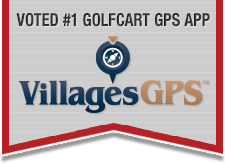 The Executive Courses in The Villages, I bet, have the highest percentage "Holes in One". (Because you are generally always shooting at the pin as they are mostly all Par 3's. An average golfer (like me) is generally hitting the green on every hole. Also many people play just about every day. When I went to collect one of my Hole in One Certificates, it took them 5 minutes to thumb through the mountain of certificates "THAT WEEK" and my name starts with "C". What did you did with your certificate. I put mine in a safe place and can't find it. Although I am told if you call the starter shack of the HIO they will refer you to their pro shop who keeps records. I guess I was lucky, as the upper-end course near Vegas where I had my one and only hole-in-one mailed me an awesome plaque for free...commemorating the occasion. Nice art drawing of the hole, the date (4/5/04), the club (8 iron)...and yardage (161 yards). A bonus was that it was a nice, flushed, high-draw shot...and we watched it disappear. Im a bit newer to golf but how in the world do you hit a 8 iron 161 yds? By being only in your late 40's.